HUMANITY IS NO LONGER ALONE IN THE UNIVERSE. AN UNKNOWABLE THREAT APPROACHES EARTH . . . AND WE ARE COMPLETELY UNPREPARED TO FACE WHAT’S COMING. Aerospace tycoon Gordon Elliot Lee cannot stand idly by while a mysterious alien presence from Delta Pavonis bears down upon mankind’s only home. 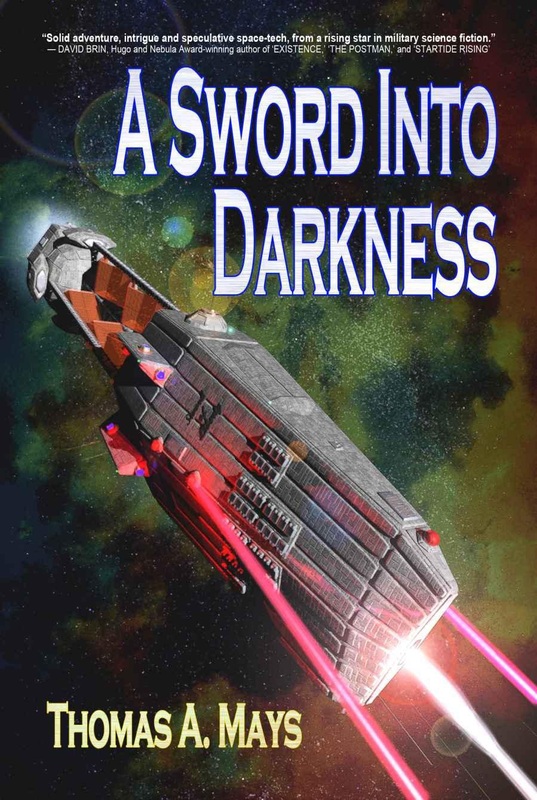 Shut out from NASA and military support, Gordon is forced to go it alone, to sow the seeds for an entirely new sort of planetary defense: a space-based naval force. Joined by Nathan Kelley — a bloodied naval warrior, scarred by his own actions in the waters off North Korea — and Kris Munoz — an avant garde scientific genius with more ideas than sense — these three will scour the very edges of fringe science and engineering to attempt development of Earth’s first space navy in time to oppose the Deltan invasion. I picked up this book because it popped up in my recommendations from Kindle and I thought it sounded interesting enough for me to have a go at it. I have to say that the book was a bit of a surprise. Not that the actual story was not what I expected but I am surprised at how much I liked the book. Most of it is simply excellent. The book starts off with the Aerospace Tycoon mentioned in the blurb above trying to convince US government representatives that aliens are indeed on their way to Earth and to take appropriate measures. Of course they do not believe him so he takes matters in his own hands and together with a band of collaborators he sets of to build Earth’s first combat capable spaceship. We get to follow the process of actually designing the ship, building it, dodging the assholes from the US government and of course finally…first contact. I found the book very well written and very captivating. The characters are well done, the science well thought through and as believable as one can expect from a sci-fi novel. Once the action starts it is as nicely done as the rest of the book. I was ready to give this book a full set of stars up until the aliens actually started to communicate and reveal why they were on course for Earth. Obviously I cannot give any details here since it would totally spoil the book but I was flabbergasted to say the least. It is quite possible that other people might like this more than me. Obviously the author thought it was a good idea but to me it was just dumb. Not dumb enough to really ruin the book for me but definitely enough to strip it from that last star. Still, it is a great book. I would definitely recommend it despite my gripe above. Computer engineer/software developer, movie (especially Sci-Fi) fantast, audio/video equipment and gadget geek, book reader and photo amateur. I’m glad you (mostly) enjoyed it and really appreciate the review here and on Amazon (I just discovered your site during some shameless vanity googling). The book is in many ways an homage of a lot of the alien invasion tales that have come before, but with my hard(ish) physics bent and my own experience in naval tactics. That being said, I was faced with a dilemma: do I pick a rationale for the invasion from among those used before, or do I try to put an original spin on it. Obviously, the original spin I chose won’t appeal to everyone, but I did want to say something about my thought process for it. Without spoiling things too much, the Patrons are in a post-scarcity society, made possible by nanotech and their drive system. So there is literally no physical resource that could drive them to cross lightyears of space to obtain, passing up more readily available systems. Similar with biological resources, they can be generated at will, tailored to their own biology without the uncertainty posed by trying to assimilate proteins not created on their own planet, assuming they even had a hankering for man-meat. Slavery is pretty much out, since the tech level implied by nano and interstellar travel would indicate they have already achieved labor saving mechanicals if they need them. If their view on the universe was an inimical one, such that they cannot abide our existence, the book would have ended after Chapter one. They could have destroyed us with velocity alone by never bothering to decelerate. If they had benign intentions, the best way to achieve a stable first contact with the least expenditure of energy, time, and effort is to call and trade communications in some manner. So I needed something that could only be obtained in one place — Earth — that didn’t violate any of the issues raised above. And even I balked when I first proposed ______ as the thing they were after. Until I realized how much people on our own planet desire and prize ______, even if they have no understanding, connection, or innate appreciation of the people from which it originated. Even after I came to embrace this as their reason for travelling, I have had to defend it more than any other aspect of the story. Many have expressed their appreciation for my attempt to come up with an original motivation, but I knew it would not sell everyone, and I also couldn’t just appeal to the “They’re ALIENS” defense. I hope to win you over more next time out, as I explore other, darker facets of this compulsion in the sequel, as well as its effect on the post-scarcity galactic society, not to mention the society here on Earth. Many thanks to you for taking the time to write such a detailed explanation on my humble blog. I understand your reasoning but I still think I need some more convincing so I am eagerly looking forward to this next book that you are mentioning. Per, I have a new book out and would love to get your opinion and review if you have the time and inclination! If so, just shoot me an email to amaysingstories@gmail.com , and THANKS!